I’ve asked my new friend Suzanne, whom I met at a Hearts at Home conference and now connect with through Facebook, to share a bit about her ministry efforts that help poor women halfway around the world. 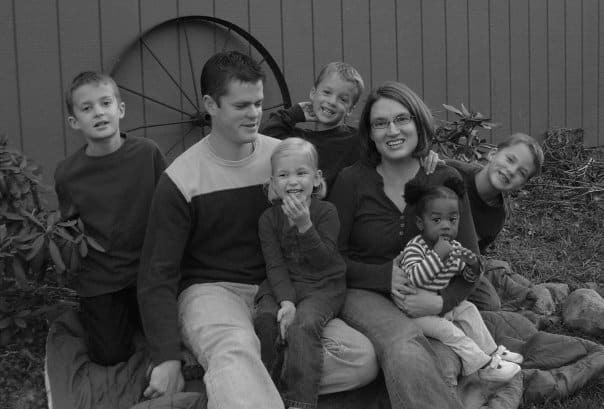 My name is Suzanne Deeren, I am a wife and mother of five. I am a stay-at-home mom, and my second full-time job involves homeschooling our children. Most of my days are spent trying to control the chaos of this big, busy family. Almost two years ago I had the opportunity to travel to Swaziland, Africa. It was a scary, life-changing decision to leave the comforts of home and travel to this unfamiliar country. God used my love for children and my passion for mothering to break my heart for the beautiful people and country of Swaziland. It was on this short-term mission trip that I was first introduced to the hand-made purses, pouches and table covers of Timbali Crafts. The women of Timbali Crafts are all volunteer cooks at their local carepoints. They cook one hot meal 6 days a week for the vulnerable children and orphans in their communities. That meal is the only meal most of the children receive each day. 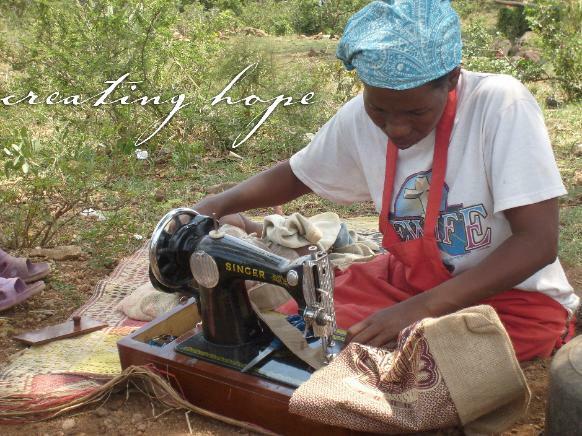 The 90 women of Timbali Crafts help feed more than 2,600 children each day at 14 different carepoints. The women face many hardships; most are either widowed or abandoned, and many are single mothers or grandmothers raising their orphaned grandchildren. I have always had a desire to live out what James 1:27 calls pure religion: caring for orphans and widows in their distress. Timbali Crafts is a perfect picture of just that: bringing women hope with the opportunity to provide an income for their families. Giving my time and energy to the Timbali Crafts ministry has become a passion for me; a way for me to continue to reach out with the love of Christ from my home, half-way around the world from Swaziland. What first prompted your involvement with Timbali Crafts? Everything I saw in Swaziland led me to the conclusion that life for the Swazi people is about survival. This tiny country at the tip of South Africa has both the highest AIDS/HIV+ rate and the lowest life-expectancy in the world. At the time of my visit I exceeded the average life expectancy of 31 years of age. In a population of less than a million there are more than 120,000 orphans and no government assistance. Life in rural Swaziland is dirty and difficult. There is no electricity or running water and very little food. There is no way to explain what seeing, holding and feeling this kind of need does to your heart, except to say, mine was broken. Everything I do to promote this Timbali ministry is done with the faces of these struggling mothers and children in my mind. What do the women get both tangibly and spiritually through the program? The women meet twice a week for Bible study and prayer, but also for cutting and distribution of fabric, turning in bags, and paydays! The money earned helps each woman provide food for their homestead, pay children’s school fees, and provides for some medical fees when needs arise. This ministry is helping to reach out to the physical and spiritual needs of these hard-working women and their families who would otherwise have little or no resources. One of the most meaningful aspects of this ministry is the ability to look up the picture and profile of the woman who created your product. The Timbali women profiles are on the website and you can look up the name that comes on your product tag. I encourage people to print out the picture and profile, and to keep these women and their families in their prayers. Seeing the faces and hearing the stories of these women is powerful. What does the word Timbali mean? Timbali means “flowers” in the local Siswatti language. It is also the word used to translate “lilies” in Matthew 6, when Jesus talked about his loving care and provision for His children. Our hope is that God will use Timbali Crafts to help meet the needs of these hardworking women and that it will be a tangible demonstration of His love. If readers are interested, how can they get involved? Timbali Crafts takes on-line orders (www.timbalicrafts.org) and every purchase is a gift that gives twice. Another easy way to have a big impact is to host your own Timbali Craft Sale. Get yourself, your group, or your family involved in meeting the desperate needs in Swaziland! You can find the details of receiving a consignment order of bags on the website, as well as, additional ideas for giving. If you want to learn more about the ministry I was involved with in Swaziland, go to www.swaziland.myadventures.org. Children’s Hope Chest (www.hopechest.org) also partners with Adventures in Missions in Swaziland and they offer child sponsorship opportunities. Thank you for this opportunity to share about this incredible ministry. To God be the glory! Finally, what is your giveaway today for one of the gals reading this who leaves a comment? I have 3 different styles of bags for the lucky winner to choose from. ~~The first style is a two-strap shoulder bag with magnetic clasp and an internal pocket. ~~The second choice is a small reversible girl-sized sling with inside and outside pockets. 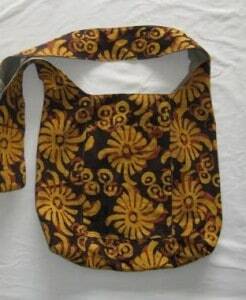 This bag also works well as a small woman sized shoulder bag. 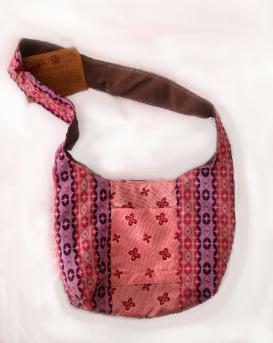 ~~The third option is a full-sized, reversible sling with an inside and outside pocket. This hands-free style is my favorite as a busy mom who usually has her hands full! Good luck ladies! Okay gals, leave a comment today and you’ll be entered to win one of the above bags. Suzanne will contact the winner to let her select the style she desires. Lisa–send your mailing address to me at karen@proverbs31.org so I can ship your gift out right away!